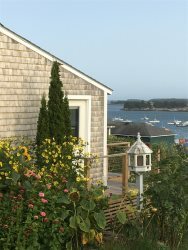 One Maine View is a newly remodeled apartment in bustling Deer Isle village. One Maine View is a second floor apartment with sweeping views of Northwest Harbor. Enjoy being a short stroll to Deer Isle’s fresh water swimming source, the Lily Pond in this central island location. One Maine View has two bedrooms and one full bathroom. The apartment has a nice open concept with the kitchen, dining and living room areas all open to one another. The kitchen is equipped with the essentials to complete many meals right in the convenience of your rental. The dining area looks out over a vast water view that the living room also shares. The first bedroom in One Maine View has a dresser, a large closet, a queen bed with a new mattress and two nightstands. The second bedroom has two twin size beds. The room also has a large closet, a shared nightstand and a dresser. One Maine View has a oceanfront deck, which overlooks Northwest Harbor. From this location you can watch the tide come and go and the sun set over this beautiful village setting. One Maine View also has a lovely picnic area in the back, overlooking the harbor, complete with BBQ grill, picnic table, and Adirondack chairs in which you can enjoy beautiful sunsets over Northeast Harbor. Deer Isle is a haven for artists, birders, hikers, boaters, and the fishing community. Haystack Mountain School of Craft is an easy drive out Sunshine Road, and the Stonington Opera House and Reach Performing Arts Theater feature performances throughout the Spring, Summer and Fall seasons. The Island Heritage Trust maintains several hiking trails on the island, including Tennis Preserve and Shore Acres, just to name two, and our Island Country Club is open to the public for golf and tennis. Deer Isle village has our own coffee roasters - 44 North, where you can get delicious coffee and baked goods most days. There are galleries, a gift shop, and a Tuesday night farmer's market in Deer Isle village, and more within a short drive to Stonington. Walk 5 minutes to the village Lily Pond - a favorite local fresh water swimming spot! One Maine View is a great, clean option for a couple or a small family. The views and convenient location make this a slam dunk rental for everyone in the group. Please reach out to us to learn more about this great rental opportunity.